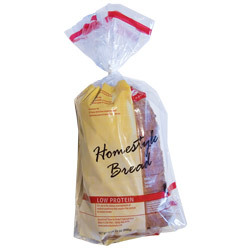 Description: Each loaf contains 16 slices of Cambrooke’s own low protein White Bread. Great for making toast or grilled cheese sandwiches. Serving Suggestions: Toast and add your favorite spread. Make French Toast in minutes using Cambrooke's Mixquick. Ingredients: Wheat starch, water, sugar, psyllium, polydextrose, canola oil, baking powder, methylcellulose, yeast, xanthan gum, salt, calcium propionate (preservative), potassium sorbate (preservative), fumaric acid (preservative), sorbic acid (preservative). Contains wheat. Submarine sandwich bread -- a versatile alternative to sliced bread.